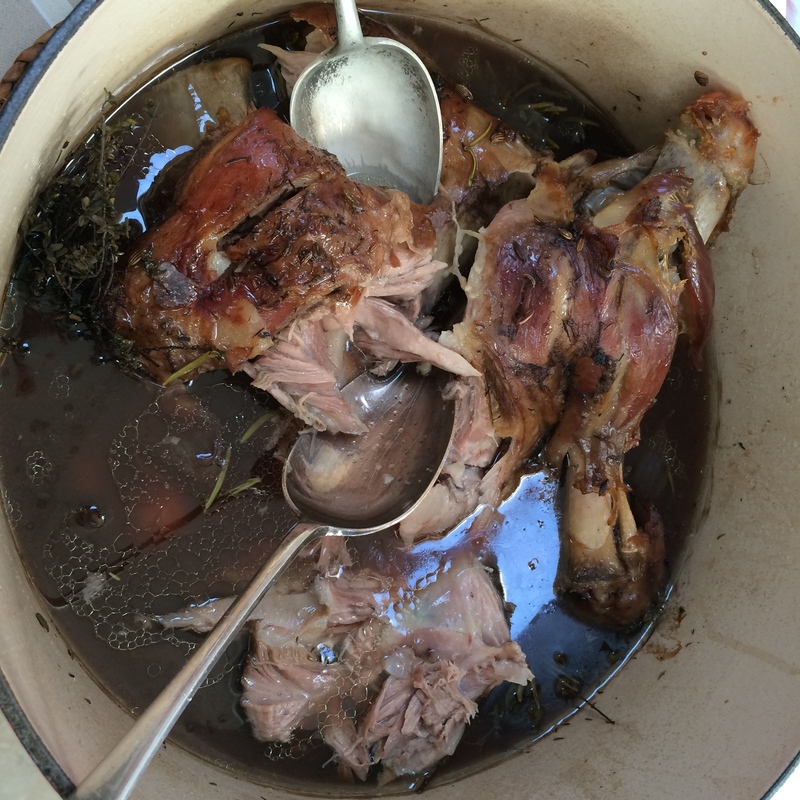 A Mallorcan recipe of melting lamb in a reduction of wine, thyme and rosemary. This is the perfect hot-pot to serve guests at a dinner party because you will have left it to cook in the oven all night and therefore only need to reheat and serve – leaving you lots of time to : A/lay a really lovely table, B/concentrate on pudding or C/ do your nails and get yourself pretty! Spring is the new lamb season so this dish really comes into his own now but do check with your butcher that he is giving you a spring lamb and not anything he’s had in the freezer for a while. Though you can also try this with a tougher goat or kid joint and it would be just as delicious and tender. OPTIONAL: Add 6 to 8 dry or fresh figs towards the end – you will love this!!! Rinse and pat dry your joint. Make a pretty bundle with the herbs, tie in string. Put the ingredients in a large pot with a lid and pour the wine over. The liquid should be at two third of the meat. Add some water if needed. Leave to cook, covered, in the oven for at least 8 hours at 160°. I put it around 11pm when I go to bed and stop it when I get up at 7:30. Season with sea salt and black pepper. Leave it to cool, then remove the fatty blob bits that solidify at the surface – it is worth doing this if you have the time, to get a leaner dish.Taste then reheat just before serving, leaving the dish uncovered. I promise you the house will smell like the farmhouse restaurant, lost in the hills of Mallorca, where I first tasted that dish. It was generously soaked in the rich wine juice and tasted as if the meat had been infused in thyme and grape juice for a long long time – which it had! 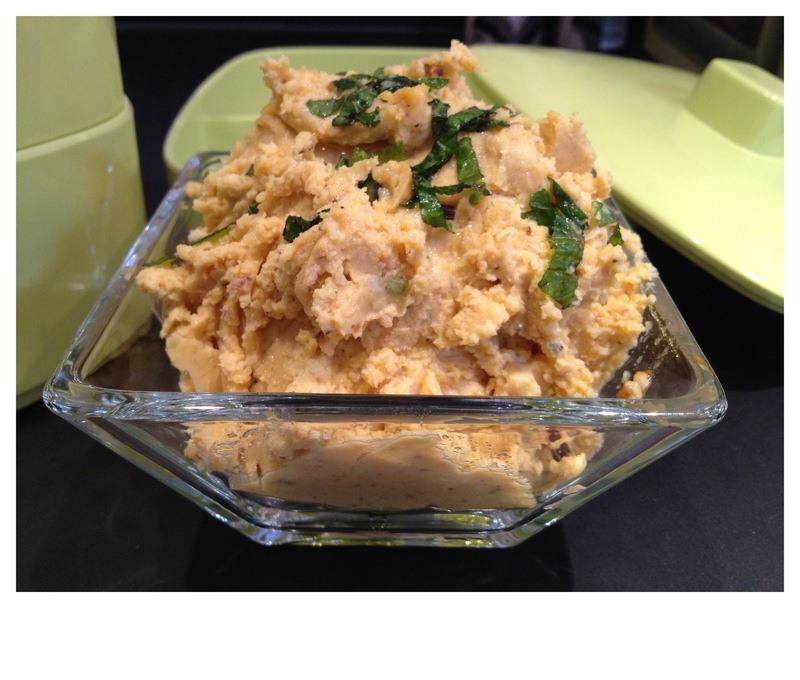 Hummus can be made with much more than chickpeas! I recently even tried a very satisfying butter beans hummus but my current favourite is a minty butternut squash version. I also like the pumpkin version from Baity’s Kitchen blog- but can’t find it right now… So here is mine. First cut up and then peel the butternut. Throw the cubes into a roasting dish with a dash of olive oil, some thyme and crystal salt. Toss it all around! When the squash is cooked – which should take less than 10 min- put it into a blender with all the other ingredients and blitz to a pulp. Add the nepita and lemon juice last. Check the seasoning. Decorate with strips of fresh mint. Eat this delicious spread on slabs of warm fresh bread! Sourcing note: Nepita is a wonderful minty thyme I brought back in my suitcase from Corsica but you can replace it with real thyme and fresh mint if it proves too hard to find. Although, if you have never tasted it you just don’t know what you are missing and in this dish it literally sings through in fresh and incredibly minty notes!